Talk of 'public hanging,' 'segregation academies' and voter suppression has drawn national attention to the state's Senate battle. JACKSON, Miss. — Racial tension permeates the air in this state like humidity — thick and stifling at certain times, less noticeable at others, but always present. Right now, it hangs heavily over Tuesday's special election runoff — polls are open and close at 8:00 p.m. ET — for the remaining two years of retired Sen. Thad Cochran's term, a contest that pits white Republican Sen. Cindy Hyde-Smith against Democrat Mike Espy, a black former congressman and U.S. agriculture secretary. Hyde-Smith ensured that racial issues would be a consideration when she was captured on video earlier this month saying that she would be "on the front row" if one of her supporters was somehow involved with a "public hanging" and invited her to attend. 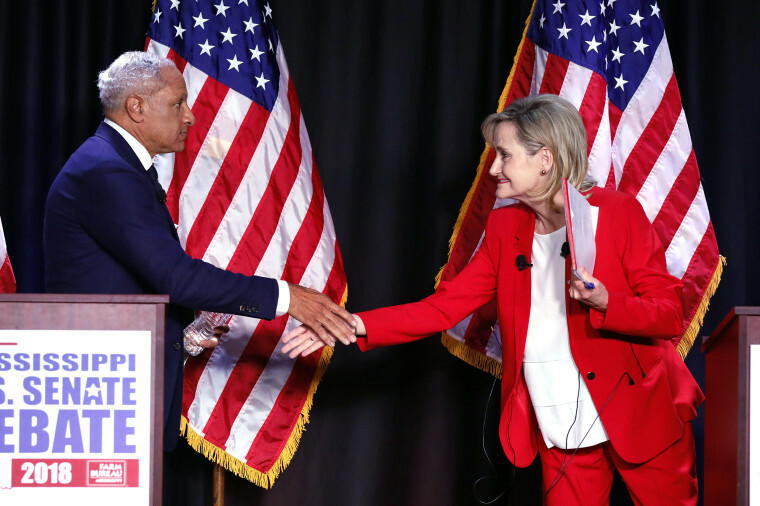 Since then, Hyde-Smith has insisted there was no "negative connotation" to what she said, offered a qualified apology at a debate, and watched as video of her encouraging voter suppression, a photo of her in a Confederate cap and a news story about her attendance, and that of her daughter, at private white "segregation academies" have made the rounds in the state. In the Nov. 20 debate, Hyde-Smith said her words had been "twisted" and "used as a political weapon against me." To anyone offended, she said, "I certainly apologize." Her remark about suppressing “liberal folks” was just a joke, according to her campaign. When Hyde-Smith made her first campaign trail appearances in more than a week on Saturday, NBC News asked what, specifically, she was apologizing for during the debate. "If I hurt anybody's feelings, if I hurt anybody's feelings — you know, we're just staying on the issues that are on peoples' minds," she said. "That is lower taxes, less regulations, Second Amendment, all of those things. So anytime I've said anything that somebody got offended, I want to apologize." For most black voters and more than a few whites here, her original remark was an all-too-familiar echo of a political, economic and social history characterized by oppression and injustice: slavery, mob lynchings, Jim Crow laws, segregation and the bloody battles over civil and voting rights for non-whites. Some Democrats saw it as yet another sign that some whites feel far less constrained since the election of President Donald Trump in 2016. "That was a red flag to a bunch of folks," said Tony Magee, a 43-year-old school administrator who pegged the last presidential election as a turning point for the emergence of previously below-the-surface racial resentment. "Things have been coming to light," added Magee, who is black and plans to vote for Espy. "It's just been more public." On Monday, two nooses were found hanging outside the Mississippi State Capitol, along with five handwritten signs affixed to trees that referenced the runoff. "On Tuesday Nov. 27, thousands of Mississippians will vote for a senator. We need someone who respects the lives of lynch victims," one sign said, a Capitol Police spokesman told NBC News. "We're hanging nooses to remind people that times haven't changed," said another one of the signs. Trump came off the bench Monday for a two-stop tour in Tupelo and Gulfport, tucked in the Republican strongholds of Lee and Harrison counties, to try to rally his base to show up to the polls for Hyde-Smith on Tuesday. He defended her response to the earlier controversy over her comment, saying he had heard her apologize "loud and clear." "I know where her heart is, and her heart is good," he said, seated next to Hyde-Smith at a round-table event in Gulfport. Hyde-Smith was forced into the runoff against Espy because no candidate won a majority in the Nov. 6 open primary. She finished first with 41.5 percent of the vote to Espy's 40.6 percent, with state Sen. Chris McDaniel, a favorite of the state's most conservative voters, getting 16.5 percent. Now, Hyde-Smith just needs Republican voters to stick together and show up for the runoff. "Don’t take any chances" by staying home on Tuesday, Trump warned Tupelo voters on Monday. Among whites, the reaction to Hyde-Smith’s comments has been mixed, but there's little evidence yet of a strong backlash that would cost her a significant share of the vote. Jim Mackay, 75, a Coast Guard veteran from Perkinston, said her words didn't strike him as racially charged at all. "They got twisted," he said in the parking lot of a Lowe's here in Gulfport. "If she had said 'lynching,' that would have been upsetting to me." He and his wife, Elaine, who is 73, said they plan to vote for Hyde-Smith. Even among those who think Hyde-Smith's words were offensive, most won't sit out the election or cross party lines to back Espy. "I certainly wouldn't condone those statements under any circumstances — it's hard to do that," said Cindy Scott, a white voter from Madison. Asked whether she would still vote for Hyde-Smith, Scott shrugged her shoulders a bit and said, "I will." That kind of response is frustrating to whites who are concerned that electing Hyde-Smith will send a message to the country that the state remains mired in a past of unapologetic racism. "I know that many Mississippians worry about sending a Democratic senator to Washington, but I worry more that Cindy Hyde-Smith, who gave only a belated and cursory apology for comments supporting voter suppression and, of all things, public hangings, will be a constant reminder of the darkest days of our history," Mississippi native Elise Jordan, an NBC and MSNBC political analyst, wrote in an op-ed in the Jackson Clarion-Ledger. "Is that a reputational risk Mississippi can afford to take?" Espy's campaign has seized on Hyde-Smith's remarks to call her "embarrassing" to the state in a new TV ad, and some white voters here say they've been motivated by that very consideration. 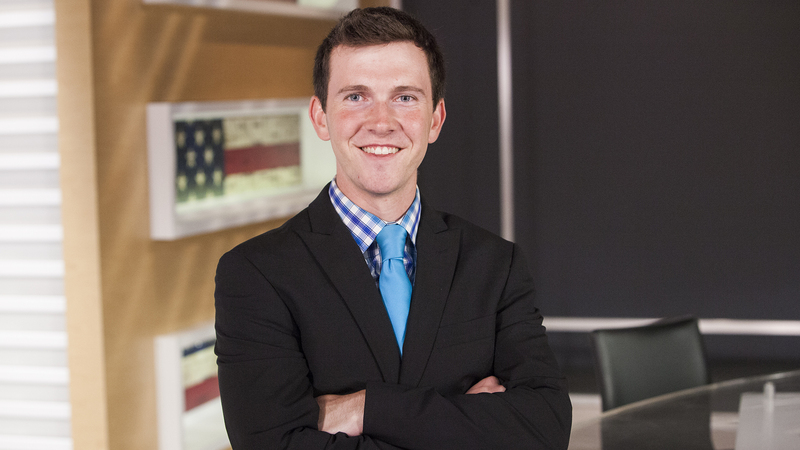 Jacob White, a Republican who didn't vote in the Nov. 6 primary, said he will cast a ballot for Espy on Tuesday. "I don't think she's a proper public figure to have, especially making comments about hanging," White, who works at the Pig & Pint in Jackson, said. "We don't need that in Mississippi. Like, we already get a bad rap as it is...Espy might be a better shot to, like, I don't get Mississippi out there. Like we're wanting to move forward." It would be the upset of more than a century if Espy wins: Mississippi hasn't been represented by a black senator since the Reconstruction Era, when the state Legislature sent two African-American men to Washington. The state's voters have never elected a black person to statewide office, a Democrat hasn't won a Senate seat here since 1982, and the Democrats who represented Mississippi in the Senate in the 20th century were mostly virulent racists like Sen. Theodore Bilbo and Sen. James Eastland. Mississippi has only voted for one Democrat at the presidential level — Jimmy Carter — since Democratic President Lyndon Johnson signed the 1964 Civil Rights Act. That year, Johnson got less than 13 percent of the vote in a state that had long been a Democratic bastion. Now, party allegiance breaks down almost exclusively along racial lines, with the white Republican majority dominating statewide politics. In 2012, President Barack Obama lost the state to Republican Mitt Romney 55 percent to 44 percent. Exit polls showed that Obama won 96 percent of black voters, who accounted for 36 percent of the electorate, and Romney won 89 percent of white voters, who accounted for 59 percent of the electorate. In Hinds County, the state's largest, Obama won 71.47 percent of the vote — or nine-hundredths of a point less than the 71.56 percent proportion of the population that is non-white. In Rankin County, the white-majority area right next door, Romney took 75.5 percent of the vote — about 2 percentage points less than the white share of the population. For Espy to win, he'll need both strong black turnout and a political earthquake among white voters. He would likely need to at least double Obama's performance with whites — or see a huge portion of them simply stay home — to take the seat. The biggest outstanding question is what McDaniel's voters will do. While he has alienated much of the Republican Party after running primaries against Cochran and Hyde-Smith, and threatening to run one against Sen. Roger Wicker, R-Miss., he has a loyal and committed base that accounted for nearly 150,000 votes on Nov. 6. McDaniel endorsed Hyde-Smith that night, but he told NBC News in an interview last week that he's not sure whether his backers will show up for Hyde-Smith or stay home. "A lot are undecided," he said. "There are many, many, many that are just uncertain about which action to take." McDaniel’s most ardent supporters were frustrated when Hyde-Smith was appointed to the seat on an interim basis and he wasn’t. Some of them see Hyde-Smith as a reflection of a party that has strayed from its conservative base. What does it say about Mississippi? For some black voters here, the prospect of Hyde-Smith winning after re-opening old wounds is grim. Glenda Marshall, 72, a retired schoolteacher from Gulfport, said she's optimistic that Mississippi will surprise the country by electing Espy. But Hyde-Smith's comments were a jarring reminder for her. "I didn't think people still thought that way," Marshall said. "A lot of people may be just like she is."